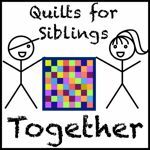 If you’ve been here before or if you follow me on IG it cannot have escaped your attention that I’ve been campaigning to get quilts made for the Siblings Together charity. I made a request for Home Sweet Home blocks in grey, green, blue and black to be sent to me. I received 323 give or take a few, I also received 2 complete quilt tops made using these blocks. I also received very wonderful donations of wadding, backing fabric, binding and funds for the project. I was slightly overwhelmed at the number of blocks received and I was delighted to receive a number of offers of help. I sent off parcels of blocks and wadding or backing to various volunteers around the UK. I also pieced at 5 tops myself. I love that a few people sneaked in another colour which then pops out in the quilt. The binding was sent by Tell Tale Threads (flickr) meant for the quilt top that she made but I accidentally forgot to pair it and that quilt top has a different binding! 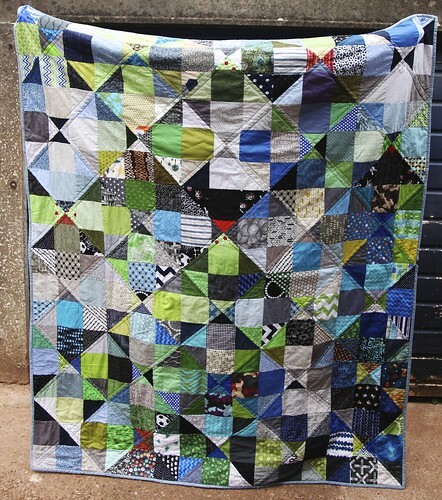 People are so generous and I was sent along with blocks some 9 patch blocks which I used in the back of this quilt. You can see how I quilted this, on the diagonal either side of the seam line. One of my goals for the 2nd quarter FAL was to complete at least 2 quilts for Siblings Together so this is the first one, there are more to come! 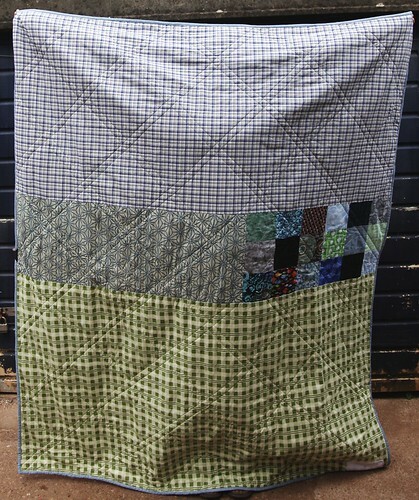 Backing fabric: green check by Verna Mosquera donated by Dorothy Hill and other fabrics donated by Carol Wilkie. A lovely quilt, which will bring joy to one of those children, I’m sure. I posted my quilts to S T just over a week ago , pleased to have helped in this project , too. Another wonderful quilt – bravo! What a lovely quilt for a great charity! **Thank you for sharing and participating in the FAL. Visiting as a member of the official 2015 Finish-Along cheerleading squad.